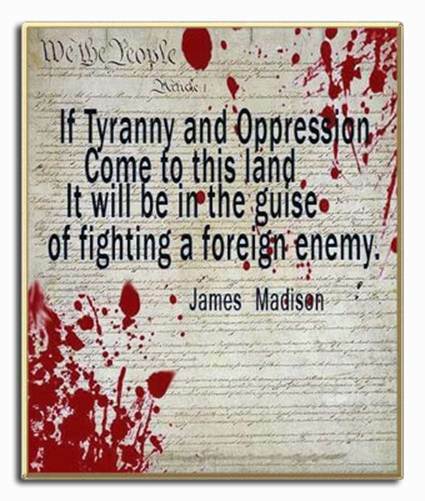 Upon further thought, Madison was right. As was Pogo. We have met the enemy and he is us. The war on terror is, every day more obviously against… us. The powers that be are so desperate to “not let a crisis go to waste,” they can’t even decide who the enemy is. The remote control for our new shop door doesn’t work unless we are within shrapnel distance due to regulations in a reaction to 9/11. We are guilty until proven innocent if we want to fly. These are only a couple things making living standards decline. Our own government has proven to be a tool of Islamic extremists.